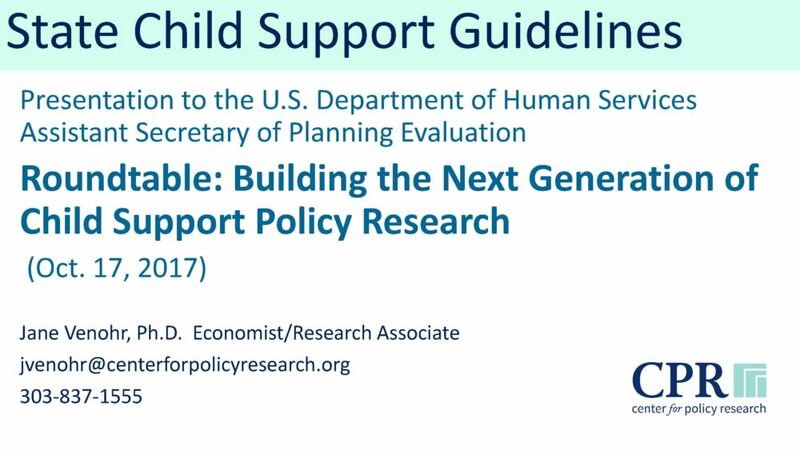 CPR Director, Jessica Pearson, and CPR economist, Jane Venohr, participated in “Building the Next Generation of Child Support Policy Research” roundtable held in Washington, D.C. October 17-18, 2017. the U.S. Department of Health and Human Services Assistant Secretary and Planning Evaluation (ASPE) convened the roundtable of about 70 researchers and child support leaders to identify gaps in current research and what research would be useful to advancing child support policies and practices. Dr. Venohr also presented to the panel on child support guidelines issues. To view her presentation click here: State Child Support Guidelines.